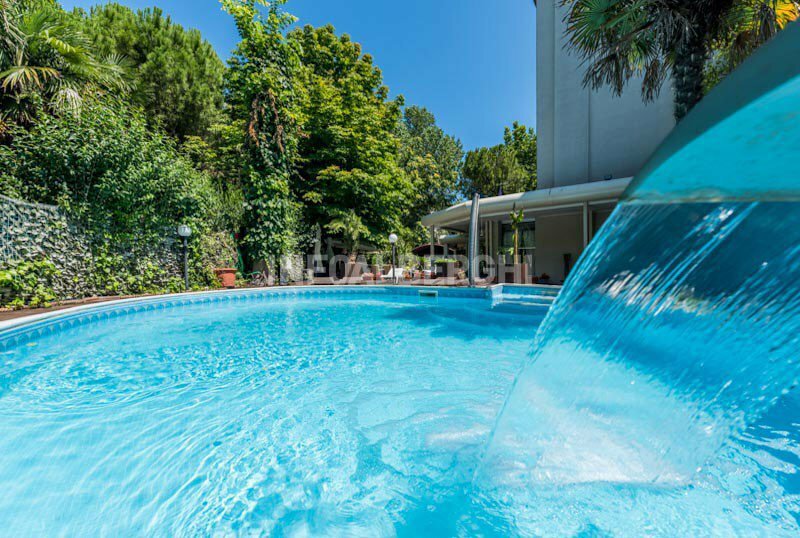 Hotel Bengasi is a three star hotel in Rimini Marina Centro completely renovated and equipped with a large garden, swimming pool surrounded by greenery and parking. Pets are allowed both in the hotel and on the beah affiliated with the hotel. The structure is located in Rimini in the Marina Centro area, less than 5 minutes from the sea and the promenade of Viale Vespucci and about 10 from the train station. The hotel is adjacent to Parco Cervi, a large green area with a cycle-pedestrian path that connects the sea to the historic center of Rimini. The area is well connected by public transport to the Fiera di Rimini. The rooms have air conditioning, WI-FI, safe, telephone, satellite TV and digital terrestrial LCD, desk, security system with code, latex mattresses and pillows, private bathroom with hairdryer and shower. Balcony on request. The hotel is surrounded by a green area and has a large garden, open-air porch, swimming pool and hydromassage area, reading room with newspapers in consultation, lift, theme nights and poolside parties, laundry service on request, bike rental for a fee . PARKING: uncovered and guarded, 600 meters from the structure. Free in winter. CONVENTIONS: beach, amusement park, discos, organized excursions on request. Free entry to the Beach Village water park with shuttle included. LUNCH AND DINNER: local cuisine with 3 choices menu accompanied by buffet of side dishes and appetizers. Pasta and desserts are homemade. VARIATIONS: vegetarian, vegan cuisine on request. The hotel has an outdoor swimming pool, open from June to September, equipped with a hydromassage jet and cervical waterfall. The nearby sunbathing area has beach umbrella, sunbeds and a furnished gazebo. It is possible to have aperitifs on the poolside. The hotel has an agreement with the beach n. 30 and n. 31, with playground area, nursery, entertainment, WI-FI and playgrounds. Pets Allowed.